I was waiting to write another post on here until I got internet at the new casa, but some stolen wireless will do for now. A lot’s changed in the last few days – I no longer work at the Evergreen or live in Pullman. The house… ah, the house. Well, it’s starting to feel like home already if that means anything. I’m sure that has more to do with who I live with than anything, but it’s home nonetheless. It’s kind of hard to believe that a week ago I was still wondering what the hell I was going to do after graduation. The job’s going well, almost to my surprise. It’s definitely something new, which I like. Today I got to talk to a guy that just signed a three-year contract with the Pittsburgh Steelers, so that was cool. I’m pretty much counting down the days until I can bring Velvet home with me. 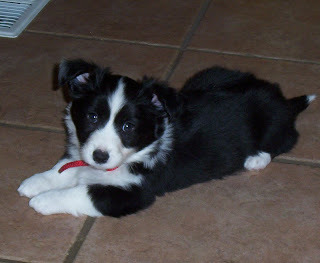 Here’s a cute adorable picture of her as a pup, because that’s how I see her in my head.